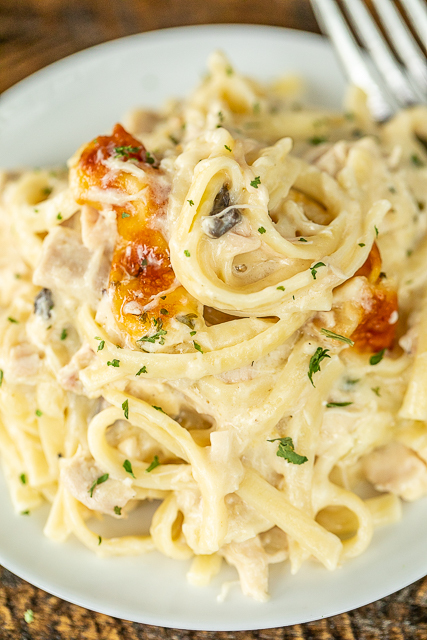 Chicken Tetrazzini is a holiday tradition in our family. My grandmother made the BEST chicken tetrazzini. It is my favorite recipe, but I am always open to trying new versions. I came across this version in one of my old cookbooks. It differed from my grandmothers recipe with sour cream in the mixture. I thought that sounded interesting, so I gave it a try! 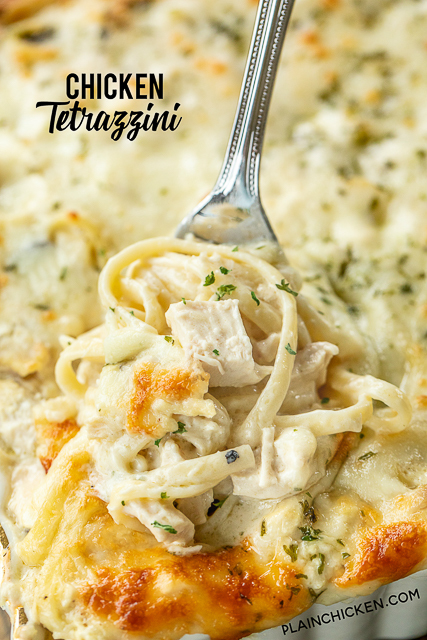 This Chicken Tetrazzini was delicious and easy to make. You can make this ahead of time and refrigerate or freezer for later. LOVE make ahead meals - especially during the holidays! To cut down on the prep time, I used a rotisserie chicken. Rotisserie chickens are my favorite shortcut. I stock up on rotisserie chickens every time I go to Costco. 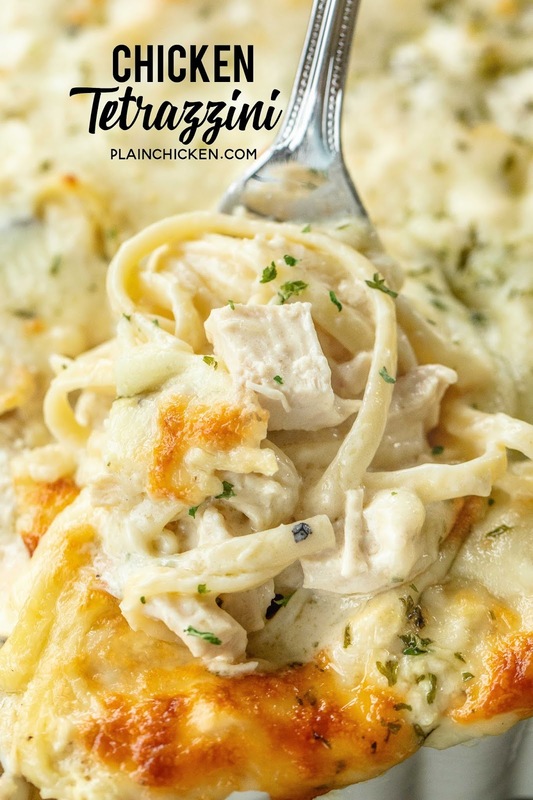 I remove the meat from the chicken and put it in freezer bags so I can whip up casseroles like this Chicken Tetrazzini in minutes. I used linguine noodles in this version of Chicken Tetrazzini. Chicken Legs prefers the thicker noodles to my usual thin spaghetti noodles. 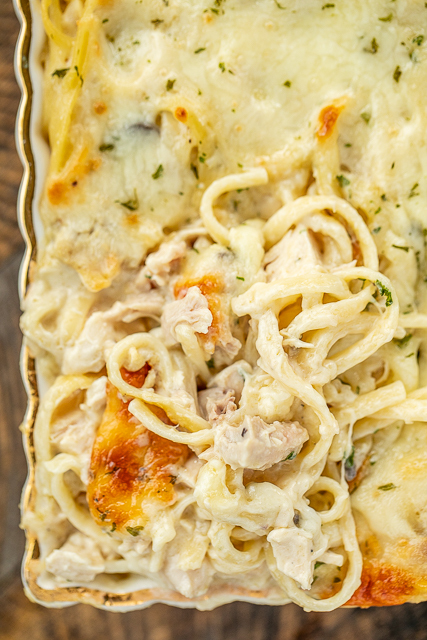 Over all, this Chicken Tetrazzini was a hit! We served it with some green beans and homemade rolls. You could also serve this with the Creamy Italiano Salad I posted yesterday. That actually sounds really delicious! Totally doing that next time! Preheat oven to 300ºF. Lightly spray a 9x13-inch baking dish with cooking spray. In a large bowl, combine chopped chicken, soups, sour cream, butter, broth, salt, pepper, garlic powder. Stir in cooked pasta. Pour mixture into prepared baking dish. 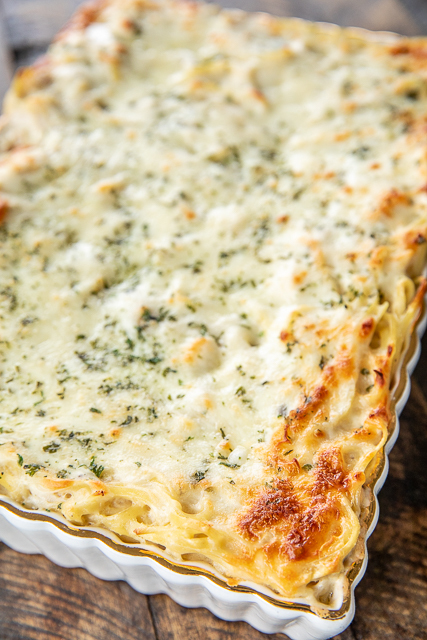 Top with cheeses and parsley. Cover with aluminum foil. Bake covered for 45 minutes. Remove foil and bake an additional 10 to 15 minutes, until bubbly and cheese is melted. If I made this as a freezer meal would I cook it first then stick it in the freezer? How long in the oven once it's thawed? Looks delicious Steph and so easy using rotisserie chicken and soups. So quick & easy! Plus it’s delicious!! Sounds delicious however my son in law can't eat sour cream is there a replacement ingredient that I can use? Thank you i found one as always i love your receipes. About how many cups chicken would you say this needs? Steph, your recipes are always sooooo yummy and not too difficult. YOUR site is my very favorite place to go for all sorts of good recipes. You NEVER disappoint. Thanks! Awww - Thanks you so much Jenn! I'm thrilled you are enjoying the recipes! First, I love your recipes! When do you use the chicken broth? It's in the list of ingredients, but I don't see it used in the instructions. Step 3 - I fixed it. Thanks! Can you use canned chicken?